Mr. Peter A. Lusztig, CGA, Ph.D., serves as Dean Emeritus, Faculty of Commerce and Business Administration, the University of British Columbia. Mr. Lusztig serves as the Chairman and Trustee of the Health Benefit Trust. He served as Director of Canfor Pulp Income Fund. He served as a Director of Canadian Forest Products Ltd. from 1983 to October 2005. Mr. Lusztig served as the federal commissioner for the B.C. Treaty Commission (Federal) from 1995 to 2003. He served as a Director of Canfor Pulp Holding Inc., General Partner of Canfor Pulp Limited Partnership and Canadian Forest Products Ltd since April 28, 2006. He served as a Director of Canfor Corp. from 1983 to October 2005. He received his Commerce Degree from the University of British Columbia, his Masters of Business Administration from the University of Western Ontario and his Doctorate Degree from Stanford University. Peter Lusztig died on January 26, 2014. I saw his picture in the Vancouver Sun obituary. I remember taking the photograph for Harvey Southam’s Equity Magazine which started in 1980. Southam had his office inside Vancouver Magazine on the corner of Davie and Richards. I particularly remember that Southam would bring his Labrador retriever to the office. 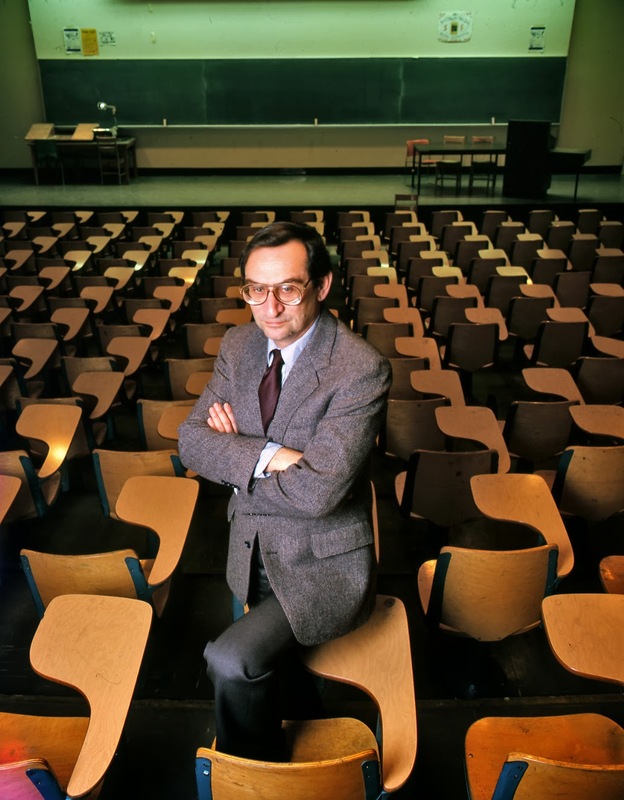 One day, perhaps in 1981, he dispatched me to photograph Peter Lusztig at UBC and when I brought my results Southam was very happy. I remember that Lusztig was accommodating to my needs and instructions on how he should pose for me. He was soft spoken and he had a kind smile and demeanor which probably made him a very good professor. I consider this photograph to be one of my first successful business portraits. Addendum: I was most surprised to find out that this picture is a Fujichrome transparency. I never thought I had used it until recently when Kodak Ektachrome was discontinued. Today I took my second to last roll of Fuji Provia. When I use up the last roll I will stop using transparency (slide) film. I will switch to colour negative. With the magazines of yesteryear all dead (and they all demanded that photographers shoot slide) I have no reason to use this film anymore. One of the losses will be that I will also not project the beautiful 6x7 cm slides with my Linhof projector which happens to have Leitz projecting lenses. Note on the bottom left how the emulsion has shifted towards magenta.